Bioluminescent bacteria are widely used in scientific research, usually as internal markers. By inverting this practice and employing bacteria as an external light source; objects and bodies, surfaces and skin were exposed to the blue green, ethereal glow of the living bacteria, establishing new points of contact and visual punctures. What is usually seen under the lens of the microscope is the source of light that reveals the features of human bodies. The images restage the long exposure of the camera lens in the improbable and at times disquieting bioluminescence that gradually fades as the bacteria die. Brodie’s lens quietly captures the ineffableness of life’s formation and the fleeting reality of subjectivity. In her photographs, the air is black but not because it is night. The hour does not matter. Bodies are exposed as if on a laboratory slide. 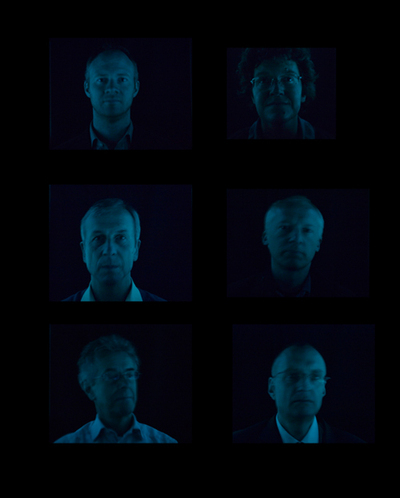 The project began in 2008 in a purpose made ‘bioluminescent photographic booth’ in a cupboard behind the Lecture theatre at the Royal Institution, with photographic portraits of the staff of the Ri and eminent professors including Lord Krebs, Richard Ashcroft, Marcus Du Sautoy, Chris Mason, Sarah Franklin and Christopher Rapley. It formed part of the exhibition Crossing Over: Exchanges in Art, Science and Biotechnologies curated by Artakt, Central Saint Martins College of Art and Design, University of the Arts London. The new exhibition saw the work return to the RI, this time out of the cupboard.